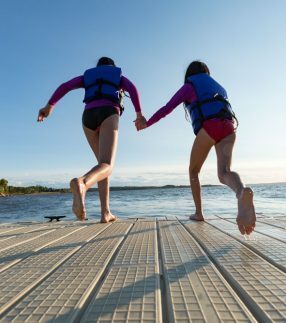 Our swim platforms for lakes are designed to be slip-resistant. Slip-resistant texture is molded right into the surface, helping to reduce the occurrence of slip and fall accidents. Grooves in the surface sluice water away, meaning no standing puddles of water when swimming. EZ Dock floating platforms for lakes are created to be durable in all sorts of weather. Summer and winter storms won’t get them down, so you can keep enjoying ideal swimming conditions year after year. Made from durable recycled plastic, EZ Dock platforms also resist rot, which makes them safer and lets them last longer. Our lake home swim platforms are ideal for the cottage or your home if you want to swim with easy access to the water. Your time is precious, which is why EZ Dock has created low maintenance platforms. You shouldn’t be spending weekends and afternoons replacing planks, taking out protruding nails or repainting and re-staining your swim platform. 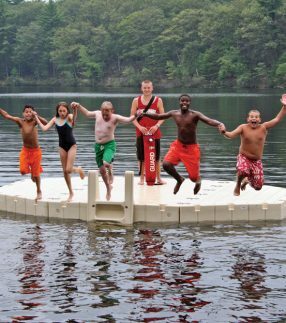 EZ Dock swim platforms are designed to be safer for bare feet and are designed to last, year after year, with virtually no maintenance. There are no nails popping out, no rotten wood, no chemicals leaking into the water from treated lumber. 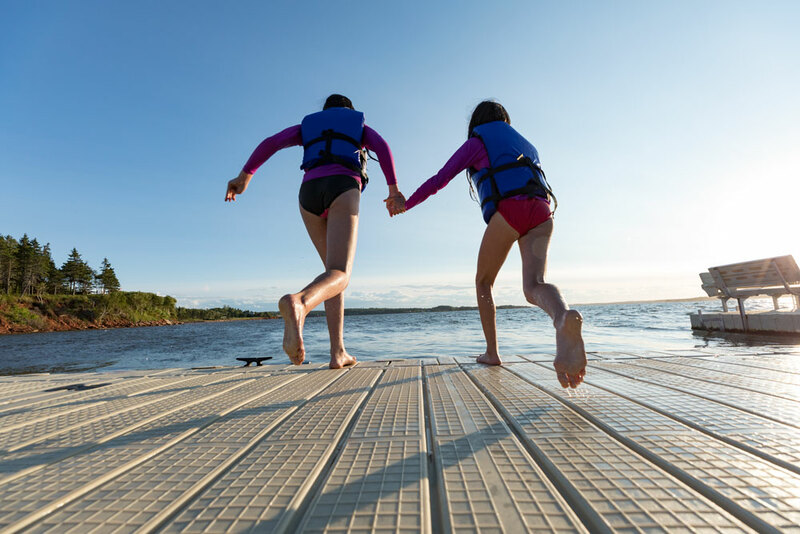 With EZ Dock products, you get just one thing: durable, high-quality docks which last year after year so you can spend more time swimming while enjoying peace of mind. EZ Dock floating swim platforms are also designed to be comfortable. If you sit on them to enjoy the water, you don’t have to worry about splinters. And the material stays cooler on hot days, so there’s less chance your feet will hurt while walking barefoot into the lake. Since you will be installing these platforms in your own lake or waterway, we’ve made these platforms environmentally-sound. Not only are they made from recycled plastic, but they will also not leak chemicals into the water (the way treated lumber sometimes can), helping you keep your lake cleaner. EZ Dock products are also incredibly versatile. You can find our platforms and docks near restaurants, homes, recreational areas, and just about every other type of waterfront property! Our customers include the military, security companies, camps, some of the most exclusive waterfront estates, and more. Our versatility allows us to build the exact waterfront swim area you want. Designed to last, our products ensure you don’t have to spend time on maintenance, allowing you to spend more time in the water. Best of all, our swim platforms will continue to function and look great, year after year. 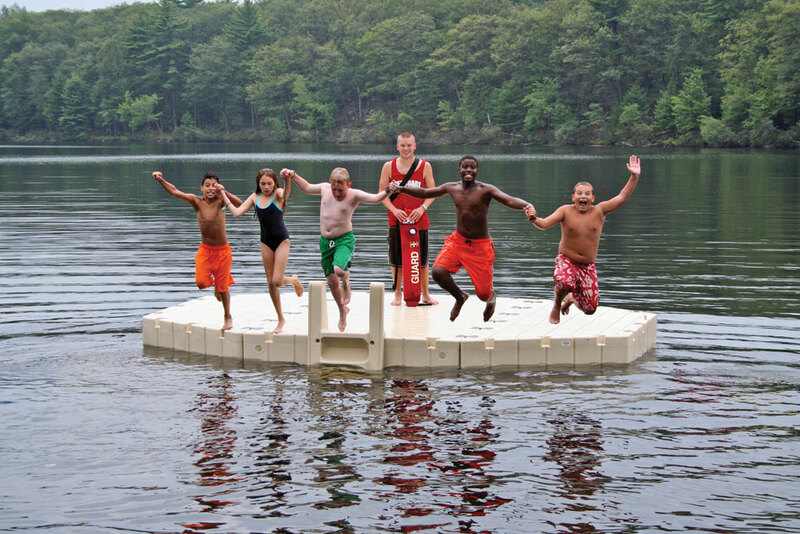 Contact your EZ Dock dealer for design ideas for your floating swim platform.